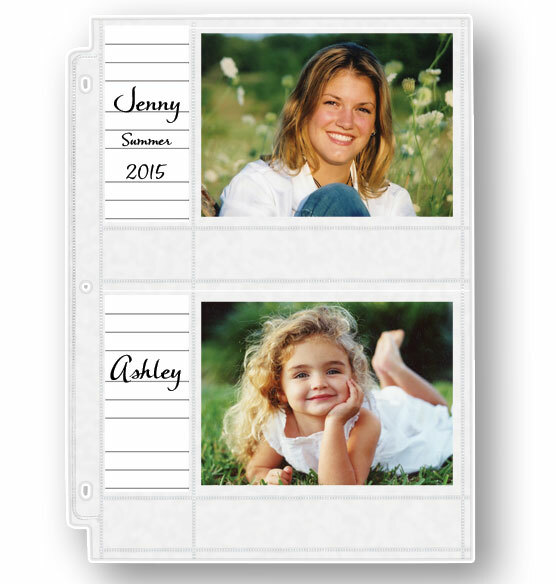 Exposures archival double weight 4 x 6 memo photo pocket pages with ID labels are made of photo safe material which makes them the safest photo pocket pages available to protect your most precious photos. 9 15/16" x 11 1/4"
Only photo pages I use! These are the only photo pages I use. 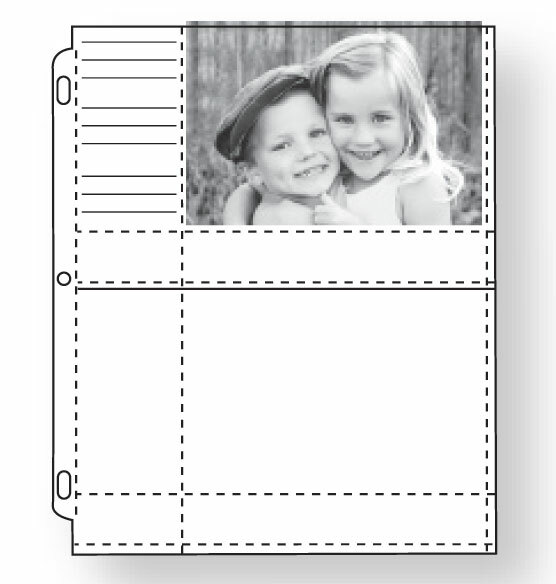 The are great for keeping my photos organized and the note areas are perfect for remember details of our special moments. Looks perfect for my son's wedding photos. 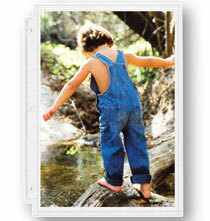 Good quality pages that allow you to tell the story behind your photos. I wish they were available in the 6-photo configuration (one horizontal on top, two vertical on the bottom) as well. have used these pages for over 10 years. i put the description, location & date on each memo. 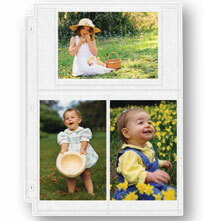 Album pages with space to write little notes will help future family generations share family traditions. wanted to be able to label and journal next to the photos. For several years, I've been replacing my old albums with Exposures Presidential albums and have come to rely on these photo pocket pages. They're durable, easy to fill, and very clear. We flip through our albums when getting together with family and these pocket pages withstand the wear and tear even after more than 5 years. Great product I would recommend to anyone who wants to create a long lasting album." To personalize my photo albums. I have some 4 x 6 photos to protect. Good quality. Item received promptly and in good condition. This will be an album of 4 X 6 photos that are too numerous to fit in the picture of the month frames. 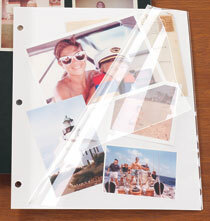 Great photo pages to use in albums. It has a memo page to write down events and dates. Very durable, and shipped fast. Great customer service. I'm creating 5 picture albums for my grandchildren. I have used these pages before and really liked them. I ordered a photo album for my 17 yr. old Grandson for his birthday. He is a track star and this Photo pages with ID labels will be perfect for him on the date and what event. Have purchased these pages before - I LOVE the fact that there are ID labels with them to mark down the names of those in the photos and the dates taken! When each of my 4 children graduate from college I give them a personalized photo album of their life through college. I'm so happy to see that with our last child, the same quality photo album exists! All four have now received the same album. I've been doing this over the span of 7 years! I have ordered these pages before. I like the weight of the pages - holds up well. My albums with these pages go back to 2004 and the plastic is still crystal clear. I am a stickler (perhaps because I am an artist) for archival materials. Purchases elsewhere and years ago for allegedly archival pages proved to be a disaster. I love your products, especially these with the ID labels. I have a GREAT DEAL of photos that need a good home. Thought I would try this to help preserve them. to put in my new album. Good weight for pictures. like the memo section using them for pictures of a 12 day river cruise. I think that these pages will work to complete my daughter's wedding album. I want to incorporate my memories beside the pictures. Hi! 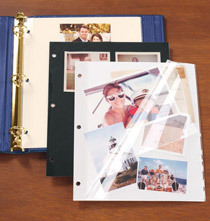 The information describing the 4 x 6 photo pocket binder pages says that the extra-capacity 3-ring photo albums you sell hold 8 sets of pages (80 pages or 320 photos), but the information for the Charter Extra-Capacity Photo Album says that particular album holds 6 - 7 sets (which would be 240 to 280 photos). Which is correct? We would not want to purchase extra pages which won't fit into our album. Thank you! BEST ANSWER: I can get at least 320 photos in my albums...I do tend to sometimes "overfill" them, but it works. The 320 should fit fine...I have at least that in each of my albums. Thank you for your question. The Charter Extra Capacity can hold up to 70 pages or 6-7 sets. We hope this information will be of help to you. Are the horizontal spaces under each photo actually pockets? Looking to add more memo area for longer journaling. BEST ANSWER: Thank you for your question. Yes, they are pocket pages. We hope this information will be of help to you. BEST ANSWER: Thank you for your question. This item measures 9 15/16" x 11 1/4". We hope this information will be of help to you.